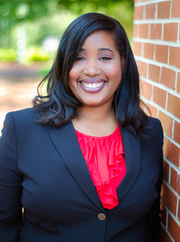 Brandi Givan is a lifelong resident of Birmingham, Al. Brandi was drawn to real estate as a teenager when her mother purchased a home for the first time. Nothing compared to the smile her mother had as she was given her keys to her new home. She worked as a Mortgage Loan Processor before taking on a job at the United States Postal Service as a Mail Carrier. While working as a Mail Carrier, Brandi had a chance meeting with Mrs. Tina Tyus, who not only assisted her in purchasing her first home, but sparked that desire to get back into Real Estate as a Realtor. As a Realtor, Brandi strives to see the smile that her mother had the day she purchased her home on all of her customers faces. Brandi is a graduate of the University of Phoenix, with a Bachelors of Science in Psychology. She is married with 2 beautiful daughters. In her spare time she enjoys traveling, reading, and spending time with family and friends.